We love sweet potatoes in our house. First they are orange and not green like most kids (regardless of whether they are on the spectrum or not), MJ has an aversion to green foods – much of which has to do with bad gut reactions from her reflux and an epic memory that associates every bad reaction or vomit to textures, colours and tastes of the last food item she ate before feeling yucky. Add bacon and well, what doesn’t taste better with bacon – especially fresh bacon from our local farmer’s market. MJ had (and still has) many texture issues, so for the longest time everything had to be pureed, so I got really good at sneaking stuff into soups. 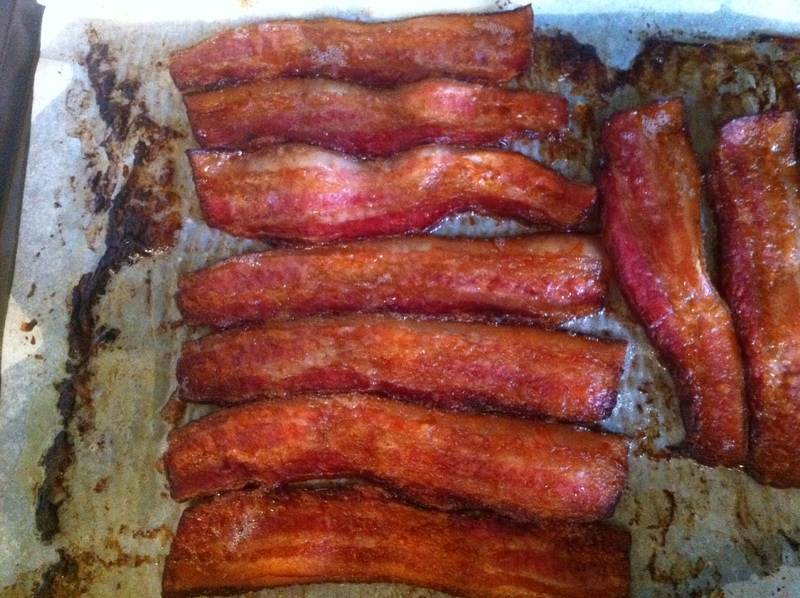 Cook about 5 pieces of bacon in the oven – 380 degrees on parchment paper f or 20 minutes. I never cook bacon on the stove anymore (thanks to a tip from a chef friend) – doing it in the oven cooks it all evenly and leaves less splatter. Using the parchment helps with clean up, because once the grease gets solid, you can roll it up and throw it out, without a lot of mess. (Note in this picture, I was also making a second recipe using bacon so there’s more than 5 pieces). Cook 2-4 sweet potatoes (I used 1 large, 1 med and 1 small for this), in the oven for about 45 min to 1 hr (poke holes with a fork and I also place them in the oven with a drip tray underneath). You can also put them in the microwave if you’re pressed for time and not opposed to microwave cooking (about 10-12 minutes depending on size). Once cooked, let them cool and then peel them. While the sweet potatoes are cooling, chop 3 cloves of garlic and one onion. Sautee in 2 generous tablespoons of olive oil. Add 1/2 tspn of cinnamon, and pepper to taste. Bring to a boil and simmer for 20 minutes. Here is where I sneak in all kinds of stuff. I generally add 2 tspns of flax and 1 tspn of infant rice cereal for that extra little iron boost and other fortified nutrients. You can add or omit as you see fit. I then add a healthy glug (I am pretty sure that’s a measurement 🙂 of maple syrup for a little extra flavour and some sweetness to the savoury. Now here is where you have an option. Do you want chunky bacon in the soup, or just the taste? If you want the taste without much of the texture add the bacon after the soup boils and let it simmer. If you want some additional texture in the soup, add the bacon after the puree step and then simmer again to release some of the flavour. I love my Braun hand blender, it’s one of the only few hand blenders I’ve found that allows you to puree a hot soup right in the pot (and not melt) which saves time and mess. 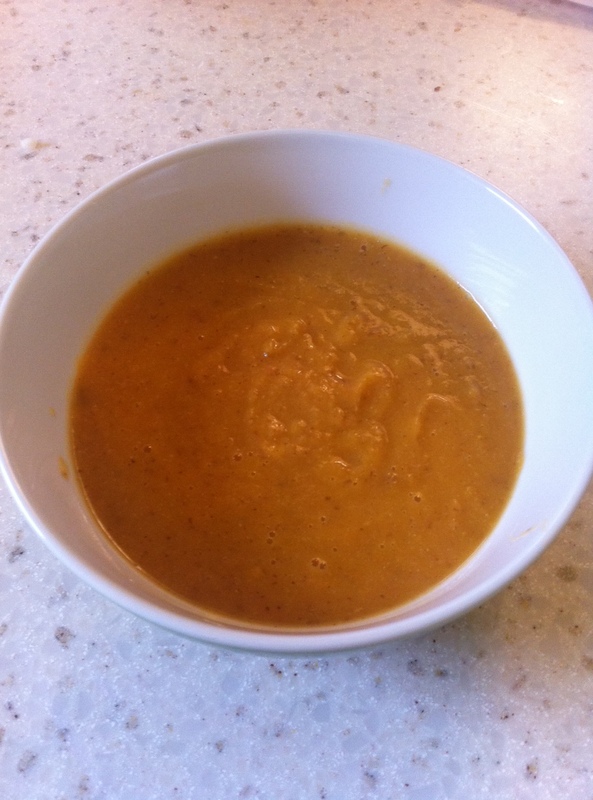 If you don’t have a really good hand blender, you can use a food processor or really good blender – but you may wish to let the soup cool first a bit. if you find it too thick, add a little extra stock. Depending on your taste’s you may wish to add a little extra cinnamon or sage at this point also. After the soup has been processed it is ready to serve, unless you wanted chunky bacon, then I’d add it in on the stove and and simmer for another 15 minutes to make sure the bacon flavour gets throughout the soup. Thanks. It’s a staple soup in our house in the winter.